I was just sitting down to write last night when I saw the news that Ursula Le Guin had died. Let’s just say it took me a while to find my writing mojo. 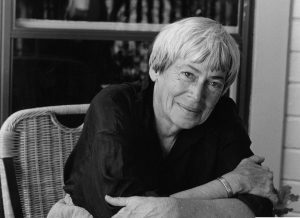 Seeing the news was like a punch to the chest, which was odd, I thought, since I wasn’t that much of an Ursula Le Guin fan. I mean, I’ve read A Wizard of Earthsea but none of her science fiction. I’m aware of her legacy and the debt all SFF writers owe her, but I’ve never read any of the works that earned her that status. It just didn’t make sense in my mind that I was so choked up over the death of someone I’d never met, whose work I’ve barely read. But then I stopped thinking with my head and started thinking with my heart. And realised, Ursula Le Guin was probably as important a formative influence on me as say Tolkien. And as anyone who knows how deeply I love The Lord of the Rings will be able to tell you, that’s a hell of a compliment. I borrowed an omnibus of the Earthsea Quartet from a friend when I was about eleven or twelve, right on the cusp of what Miss Eglantine Price would call “the age of not believing.” That is to say around the age when a child’s mind still has enough innocence left to harbour the belief that fairytales can be real. And it occurred to me while digesting the reality of Ursula Le Guin’s passing that that was roughly the age I read The Lord of the Rings at. Indeed, now that my memory has been jogged I have a recollection of my friend suggesting I read Earthsea in response to me begging for more books like The Lord of the Rings. If reading The Lord of the Rings was my first faltering step down the path to science fiction and fantasy geekery, Le Guin’s writing was what truly set me on my journey. The journey to becoming who I am today. Needless to say, I’m not sorry I never gave the book back. I have few memories of actually reading Earthsea; I remember learning about the power of names, and I remember Ged, and I remember something about making choices. And I have a vague idea that the second book The Tombs of Atuan was my favourite, and I remember that I didn’t finish the last book for some reason. But despite the vagueness of my memories, I have no doubt that reading Le Guin was an important part of my young life. 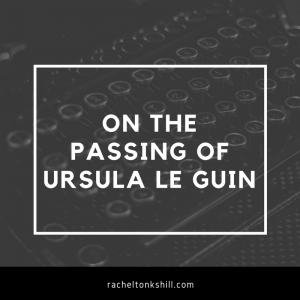 And while I haven’t read much of her other work, nor have I looked back at Earthsea though the eyes of an adult, I know how important Ursula Le Guin’s writing is to me. Important enough to inspire grief and tears, and the determination to continue her work as best I can. And as I said in return, it would be an absolute honour to be like Ursula Le Guin when I grow up. Rest in peace Ursula, we’ll carry you in our hearts as we march on. Previous Post Novis is out today! Happy Novel Birthday to me!